No later than the effective date of the discharge or layoff, all discharged or laid off employees must receive a pamphlet from the California Employment Development Department (EDD) entitled “For Your Benefit” (DE 2320). California Unemployment Insurance Code 1089 requires employers to give a written Notice to Employee as to Change in Relationship form to all discharged or laid off employees immediately upon termination. No written notice is required if it is a voluntary quit, promotion or demotion, change in work assignment or location or if work stopped due to a trade dispute. The Department of Health Care Services requires employers with 20 or more employees to provide the Health Insurance Premium Payment (HIPP) notice, DHCS 9061, to certain employees covered under the program. California Labor Code Section 2808(b) requires employers to provide to employees, upon termination, notification of all continuation, disability extension and conversion coverage options under any employer-sponsored coverage for which the employee may remain eligible after employment terminates. If an employer intends to layoff 50 or more employees, a WARN Act notice must be sent out 60 days prior to termination. The Internal Revenue Service (“IRS”) may also require notices to terminating employees within certain time frames to advise them of their rights to retirement benefits. If retirement benefits are applicable, seek guidance from the IRS. Notifying an employee of termination is never an easy task. However, there are some ways to make the notification process easier. First, plan a meeting during with the employee. At the meeting, the manager should provide a short explanation for the decision. This is not the time to delve into the employee’s employment history or negotiate extending the working relationship. Remember, employers are not required to provide an explanation for their decision to at-will employees. It is strongly recommended that this portion of the meeting be kept short with as little information offered as possible. Disgruntled employees and clever attorneys can easily misconstrue such statements. The meeting should also include information on the employee’s final pay and benefit information, including COBRA. Have the employee sign all necessary documents and provide the required documents mentioned previously in this letter. Obtain any company property from the individual. Discuss any severance offer and provide a separation agreement, which should contain a release of claims. Seek the advice of an attorney in drafting this important legal document. Let the employee know that they are free to sign the agreement in your presence or take it home to review. Do not go into detail about the terms of the agreement, other than the amount. If the individual responds with anger, the manager should stay calm, give the employee time to vent, and then repeat the employer’s message. Show compassion and understanding for someone who responds emotionally to the news but return to the company message. Other employees will certainly want to know about the termination(s). It is important to provide a truthful explanation while maintaining privacy of the employee. Simply explain to current employees about how job duties are going to be divided up. Provide customers with reassurances that their needs will still be met. Once again, do not share details of the decision or disparage the former employee in any way. 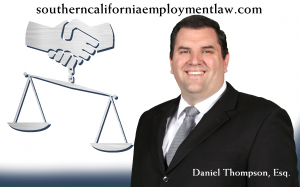 Daniel Thompson is an employment lawyer with Davis & Wojcik APLC, a Southern California based law firm with offices located in Temecula and Hemet. He can be reached at (951) 652-9000.